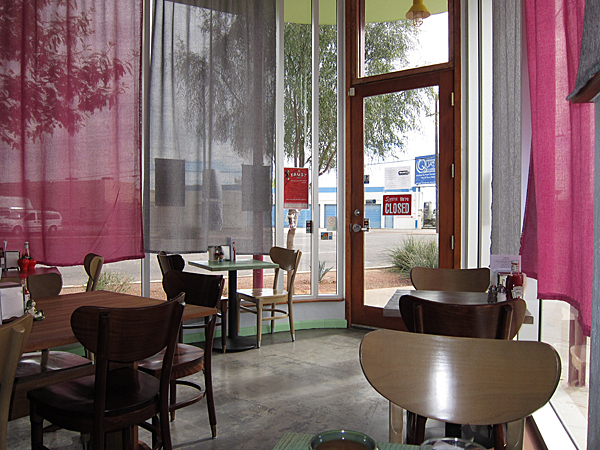 Vegetarians and vegans in Phoenix have another great option for breakfast, lunch and dinner. Bragg’s Factor Diner has taken root in the old Bragg’s Pie Factory on Grand Avenue and is cooking up healthy food with a unique twist. 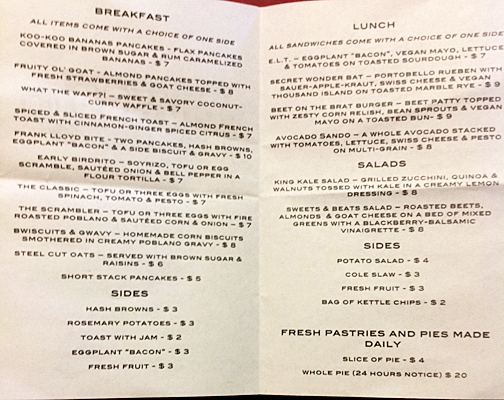 I’ve visited Bragg’s three times (twice for breakfast, once for lunch), because I wanted to get a good sense of different menu items. The restaurant is small, but cute, with lots of light. It’s in a classic restored Phoenix building, and the decor of the restaurant also leans toward vintage. The walls are ornamented with photos of “old Phoenix” and the tables and chairs are great flashbacks. The menu is fairly limited, but they are adding new items on a regular basis and often offer daily specials. However, I would like it if they would be more blatantly clear about what is vegan vs. vegetarian on the menu. I’ve been spoiled by Green and forgot that sometimes seeing the word “cheese” on a menu does actually mean cheese! My first trip to Bragg’s was during their first week of business. I ordered the Early Birdrito, which was supposed to be a tofu scramble with soyrizo and veggies in a tortilla, but they had run out of tortillas already so it was served on bread. I liked the flavor of the scramble, but it wouldn’t be fair to post a picture of it since it looked a bit sad on bread. I chose hash browns for the side. I liked how thin they were, but made note to order them “extra well done” next time. My husband loved his order of The Classic, made with tofu, spinach, tomato and pesto. It hit the spot perfectly for him. The rosemary potatoes were well-seasoned but also could have been cooked a bit more. 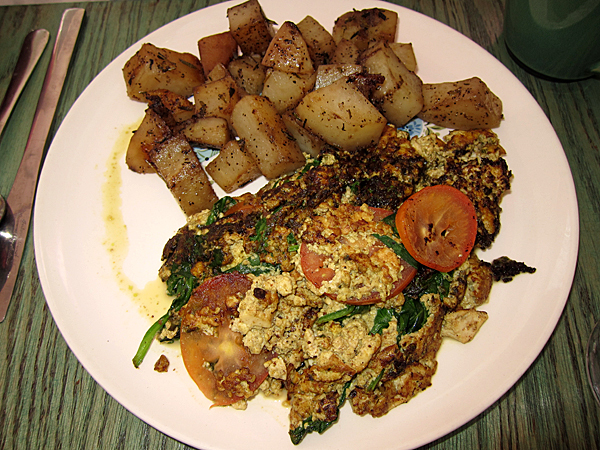 I’m a fan of tofu scrambles with pesto in general, so I hope to try it on a future trip too! We also sampled a chocolate covered donut. 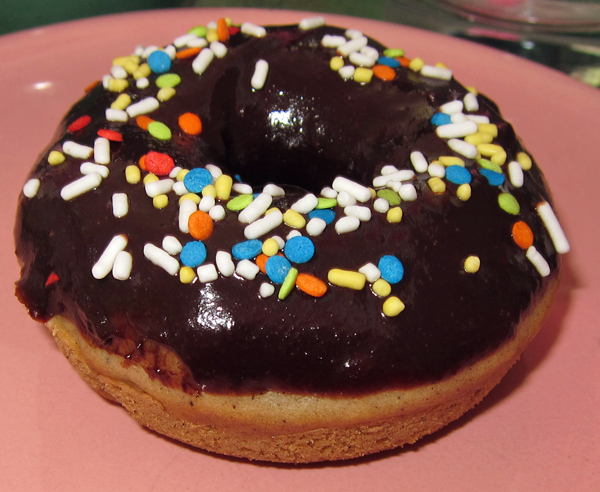 The chocolate frosting was thin (more like a chocolate sauce), and the cake donut was a bit dense, but it had sprinkles so that makes up for the lack of fluffiness all around. However, my favorite part of the meal was the coffee! I’ve always been a fan of classic diner-style coffee – strong, cheap and bottomless! Maybe I spent too much time in old Florida and up-state NY diners, but Bragg’s coffee just seemed right! The second trip was for lunch, since I was very curious about the Beet on the Brat Burger. I liked it and would order it again. 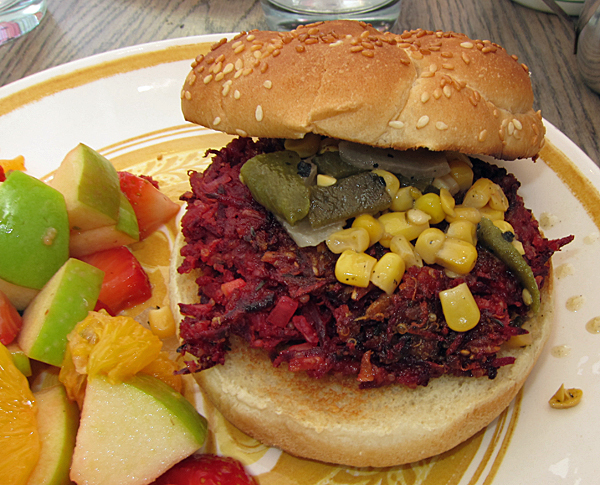 It had a light beet flavor, and the corn relish provided a nice contrast. It could use a touch of vegan pesto to zest it up a bit though. My husband ordered the Secret Wonder Bat, but forgot to ask them to leave off the Swiss cheese, so I won’t post a photo of that either (he removed it once we realized the mistake). He liked the combination of the tartness of the mushrooms mixed with the sauer-apple-kraut and Thousand Island dressing. Visit number three was a chance for us to try the Bwiscuits & Gravy. These are not light and fluffy southern-style biscuits. They are corn biscuits, and were very dense. They probably could be half the height and still make a hearty meal. The poblano gravy was a bit sweeter than I was expecting, but it was tasty! And the hash browns were cooked to a perfect crisp this time! Our real motivation for this trip though was a special they had on their Facebook page — almond & strawberry shortcake with coconut whipped cream! It was awesome! 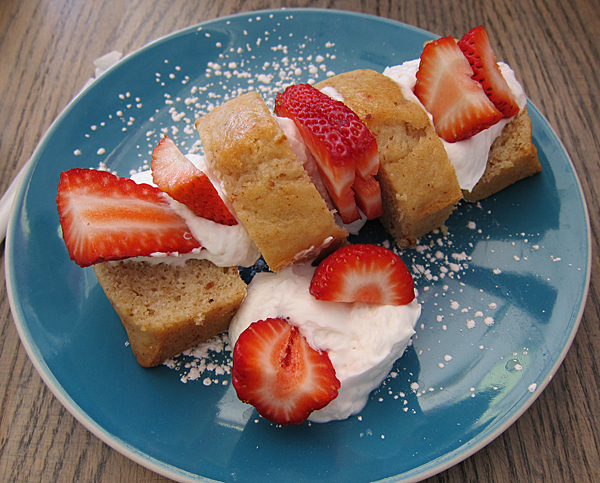 The shortcake was light and full of flavor, and the coconut whipped cream blew me away. I wanted five more orders! I hope they put it on the menu eventually! I would be remiss if I didn’t mention one of the best aspects of the restaurant: the service. On each visit, we were greeted warmly, and promptly served. Even when they got busy, they stayed on top of orders and didn’t seem panicked. 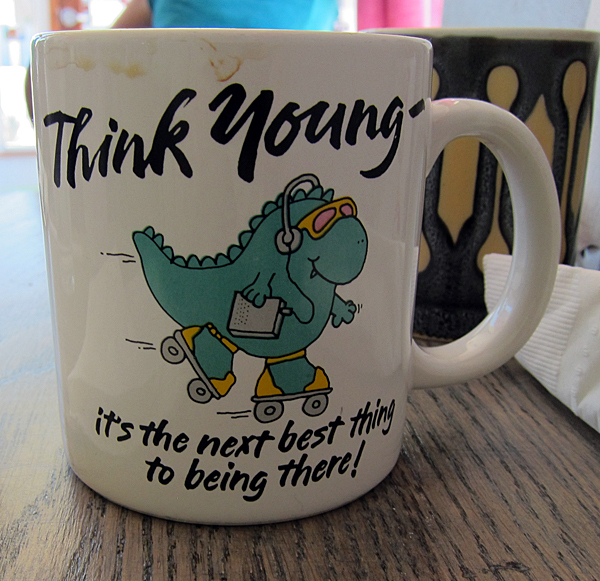 And I never saw the bottom of my coffee cup. That’s a great achievement for a new restaurant. We’re adding Bragg’s to our regular restaurant circuit and are glad they are open for dinner now too! Another benefit of frequent visits is that Bragg’s is close to my favorite bakery, Treehouse, so be sure to stop by there to grab a treat for later in the day! While I wouldn’t call Texas a top vegan travel destination, it does offer some unique eats that always makes the trip worth it. 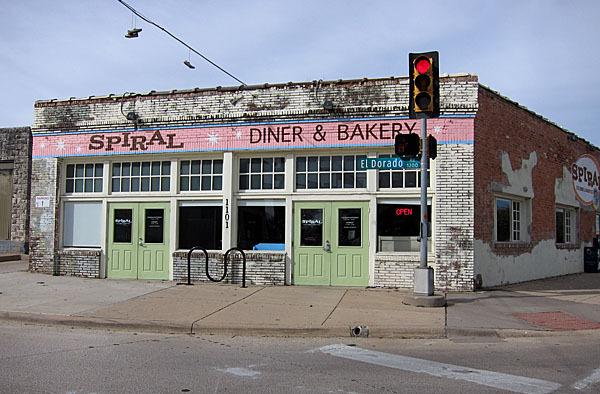 On one recent visit to the Lone Star State, we trekked to Dallas and visited Spiral Diner & Bakery. Spiral is the closest to Phoenix’s Green Vegetarian that I’ve experienced in Texas. 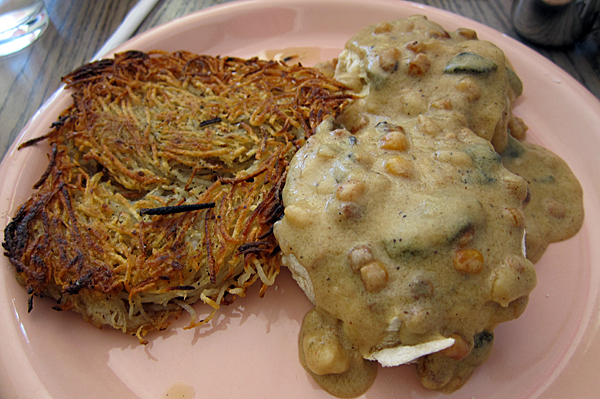 It’s completely vegan, and serves “comfort food.” The menu has a lot to offer! I tried the Patty Melt. It was a soy burger patty with melty Daiya cheese and grilled onions. 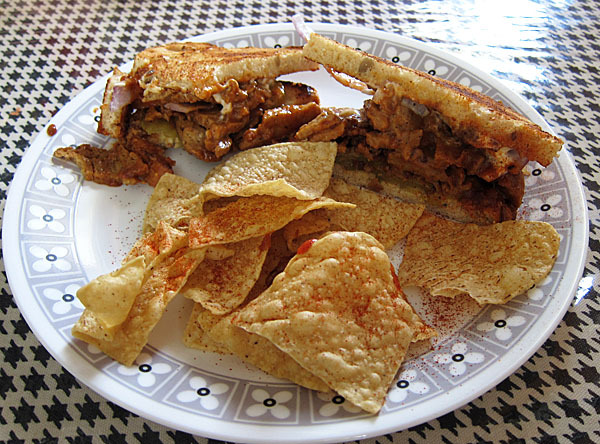 My husband is a sucker for vegan “barbecue” and got the Chopped BBQ San’ich. 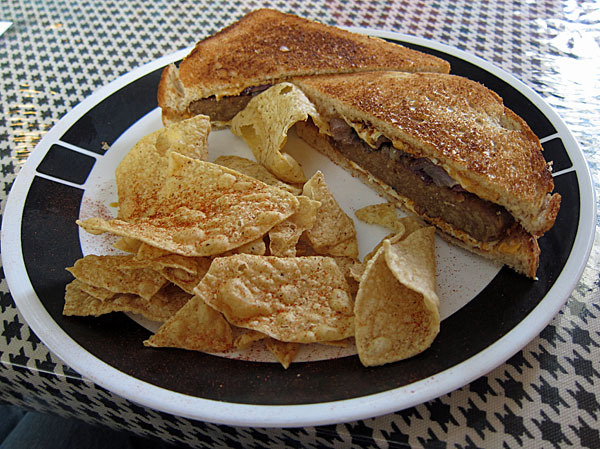 The grilled seitan and barbeque sauce were sloppy and delicious. Best of all was the desert. We had a slice of coconut cake. 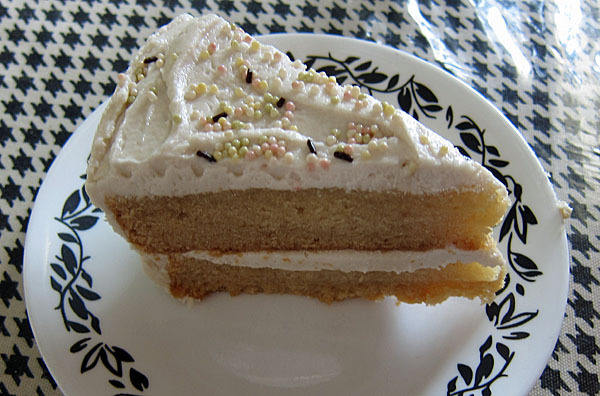 It was light, moist and the frosting was particularly great. Sprinkles! Spiral is a bit off the beaten path of downtown Dallas, but it’s worth the effort to get there! We were sad that we weren’t there long enough to try them for breakfast. As big as it is, I can’t help but feel there is a lot more to explore in Texas! If you have any vegan favorites, especially in Austin, please let me know so I can try them next time I’m there! New menu at Green and Bragg’s Factory Diner coming soon! 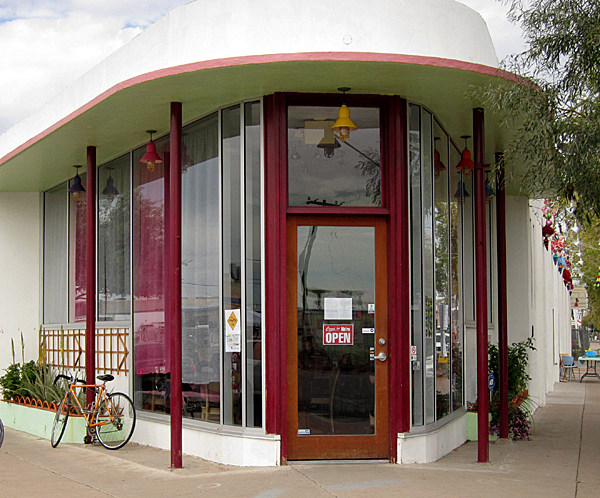 In case any fans of Phoenix’s Green Vegetarian haven’t heard the news yet, proprietor Damon Brasch has made some changes to the menu to start the new year. Gone are the flatbread pizzas, the Green burger, the meatball-oriented items (po-boy and bowl) and maybe a few other things I didn’t order frequently. However, the additions more than make up for the losses. To start, the Big Wac is on the menu! I was never a fan of the non-vegan version, but Green’s is out of this world. It will be very hard for me to not get the Big Wac every time we go to Green. I resisted the urge today (having already gotten one earlier in the week), and instead tried the Artichoke Chicken Salad, along with the Mac n Cheez from the kids menu. 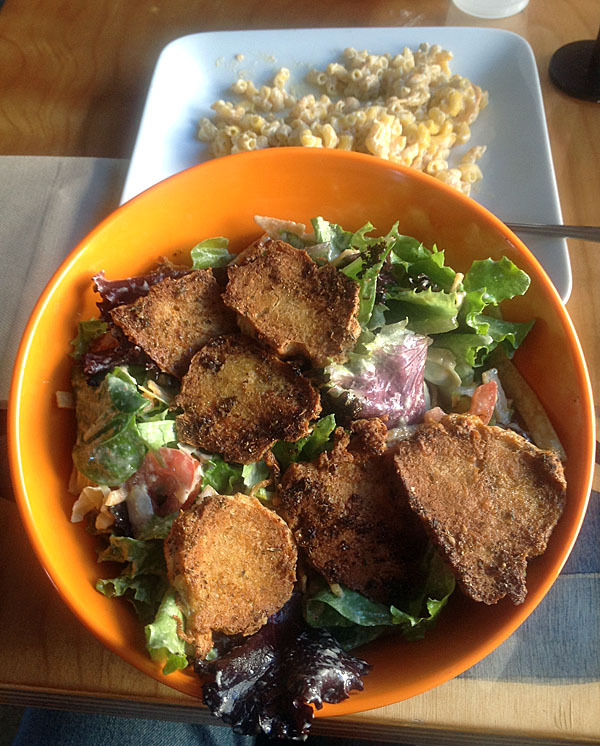 The blackened mock chicken in the salad was crisp and lightly spiced. I’m not usually one for a creamy dressing, but the light lemon flavor sat well with me. The Mac n Cheez had a good blend of Daiya and what I assume was a homemade cashew cheese, which made it nice and gooey. I was surprised that there was a touch of garlic in it though, given it was for kids. My husband’s choice may be a challenger to the Big Wac’s priority status. The new BBBQ Bacon Burger was messy and fabulous. 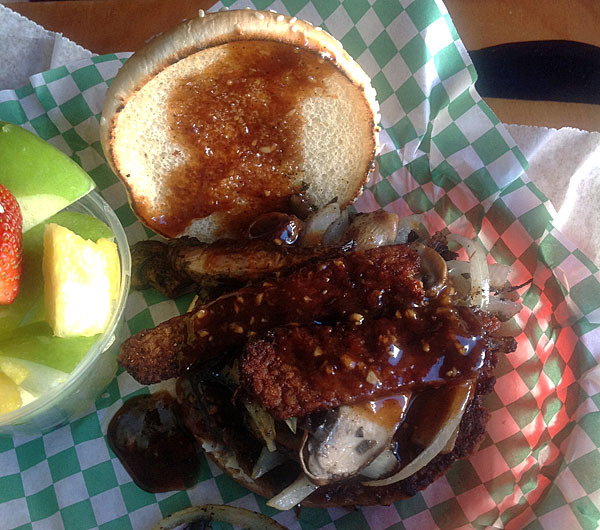 It was the same thin burger patty used in the Big Wac, but it was covered in tangy barbecue sauce, caramelized onions and tempeh bacon. It also comes with oodles of mushrooms. I’ll be opting out of those when I give it a try. 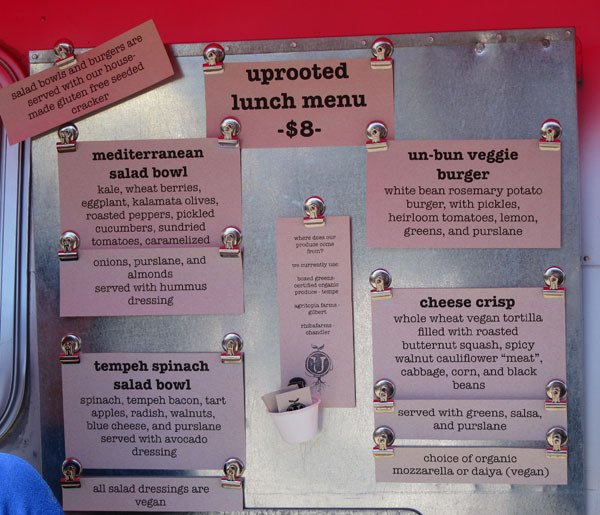 Next on the list for us to try is the Lemon Pesto bowl or maybe the Black Jack Pita. Other news of note is that the Wendy’s Pickle is now officially on the menu instead of being a whisper item. Also new is a Blonde Alfredo bowl, but I’ll have to be talked into that since alfredo sauce has never been a favorite of mine, even in pre-vegan days. (Although oddly enough, the Ritz Carlton made a vegan alfredo for me at an event I was at recently, and it was outstanding.) Additionally, the menu now features “kids” items, such as a nice basic burger, pita-quesadilla and chicken nuggs or digits. I was assured that immature adults can order from it too! Get in there and have fun trying all the new items! Thanks to a tweet from @WesleyTech, I also learned that a new vegetarian and vegan restaurant is opening up in the old Bragg’s pie factory on Grand Ave. south of Roosevelt, which will be called Bragg’s Factory Diner. They don’t seem to have a website or menu up yet, but they are actively monitoring their Facebook page and said they will probably open in March. And there will be pie! However, they are so close to my other favorite, Treehouse Bakery, that pie may be less of a priority than vegan Pop Tarts. I’ve been obsessed with Wagamama for well over a decade, when a friend said, “You’re going to London? You have to go to Wagamama.” If you’re from the U.S. you’re probably saying “Wagawhat?” But hopefully that will change someday soon! Which do you think I went to? Anyone who has traveled with me to the U.K. knows that as soon as I can, I make a beeline to the nearest Wagamama. It’s a chain restaurant, and they’ve multiplied like bunnies since first opening in 1992, with locations in Europe, the Middle East, Australia, New Zealand and the U.S. Lucky for me, on my last trip to glorious Britain I stayed in a hotel with a Wagamama in the basement (I didn’t plan it that way, I swear). So far, Wagamama has only slightly penetrated The States, with three locations in the Boston area (we’re tied with New Zealand – yeay!). I think Wagamama must mean “good luck” because one of them is very near my company’s headquarters, which means I can usually get at least one visit in every year. What’s so great about Wagamama, you ask? My answer: pretty much everything. It’s a “rice and noodle” casual dining Asian restaurant, with a blend of Japanese, Chinese, Thai, Indian and Vietnamese items. And if you’re thinking that this is another Pei Wei, think again. 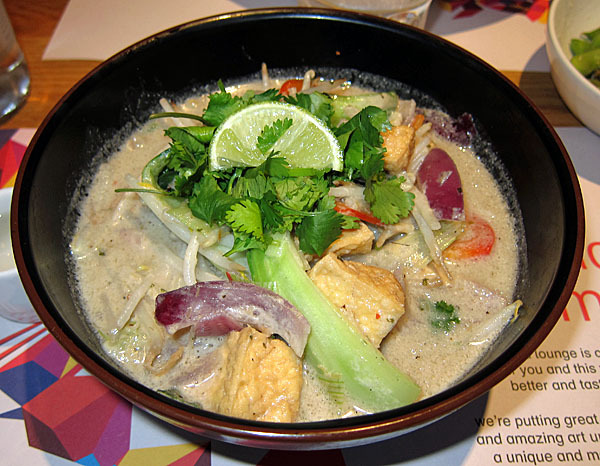 Wagamama offers a wider variety of flavorful dishes, and has more to offer for vegans and vegetarians. It’s the kind of place where everyone can find something on the menu to like, and they make it very easy for vegans to get a great meal by providing a vegan menu online. It’s also a great choice for gluten-free diners. I have a bad habit of getting the same one or two things every time I go because I usually only get one meal in during a trip. I at least try to vary the starters if I’m dining with a companion. 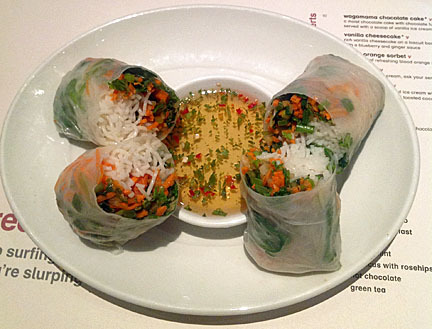 On my last visit, I tried the Summer Rolls. They were light and fresh, and were served with a sweet chili, garlic and cilantro dipping sauce. I’ve tried the edamame with chili and garlic salt before – which is just fine. The Yasai Gyoza (veggie pot stickers) are also great, but I’m pretty sure they aren’t vegan – just vegetarian. If your meal doesn’t come with Miso Soup, you should definitely order a bowl as well! My default entrée of choice for years was the Yasai Chili Men. 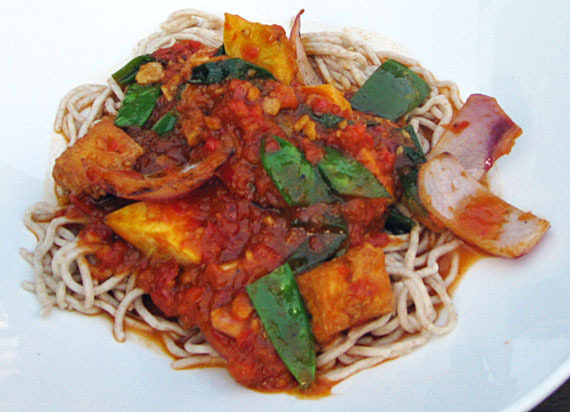 It’s a huge bright red bowl of veggies, tofu and noodles that provides plenty of heat in the mouth and belly. Since I’m usually traveling for work when I go to Wagamama now and not wanting my dinner to keep me up late at night, I’ve switched allegiances to some other favorites with less after bite. As boring as it may sound, my latest favorite is the Yasai Cha Han (order it with no egg to make it vegan). 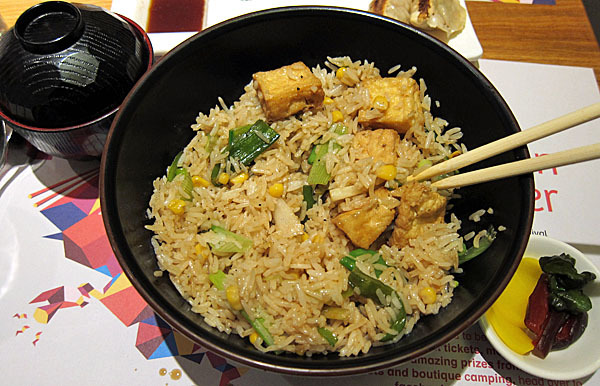 It’s basically fried rice, but it’s not greasy and nasty like some fried rice can be. Instead it’s light, hearty and full of subtle flavor. It also comes with Wagamama’s wonderful vegan miso soup, which is a life saver on a cold night in Boston. It’s usually what I get if I’ve arrived in town late and want to go to bed without a gut full of spice. But the entrée that keeps me going back for more is the Yasai Itame. This delicious noodle soup is made with coconut milk, rice noodles, a light hint of chili and ginger spice, and tons of tofu and vegetables. It’s always way more than I can eat, but I try to at least finish the tofu off. If you order it, make sure you squeeze lime into it to bring out the flavor even more. If you have room left after all of that, Wagamama usually has a vegan sorbet that makes a nice palette cleanser. However, on my last visit in the U.K. they offered a vegan “ice lolly” that I thought would be something unique and fun. Instead it was a pre-packaged fruit juice popsicle shipped from somewhere in the U.S. Oh well! There are other vegan entrees on the Wagamama menu that I haven’t tried yet. Maybe if they ever make good on their promise to open hundreds of locations in the U.S., I’ll feel less pressure to always order my favorites and will experiment more with the menu. 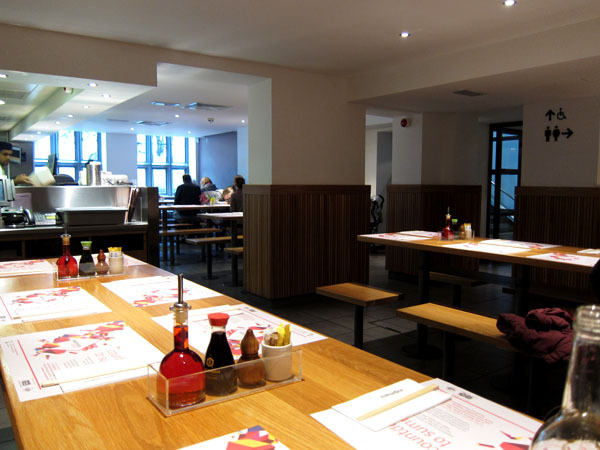 Beyond the food, the ambiance of Wagamamas always makes me happy. The restaurants tend to be in basements, so you feel like you’re descending into someone’s hidden, private space (except the Tower Bridge location in London — that one is down right scenic). The servers are always friendly, but not chatty, and very good at their jobs. In the U.K., they sit you directly with other people at long rows of tables, so you usually get to meet fun people from a wide variety of countries. In the U.S., while the tables are still long, they put small gaps in the rows so the visual of open dining is still there, while giving territorial Americans some sense of privacy. Maybe when they move west that will change. The ordering process is unique as well. Wagamama is the first place I had been to where the servers used hand-held wireless devices for orders and credit card processing – and that was more than 10 years ago! It was cutting edge high-tech to me at the time! Every menu item has a number, and the servers don’t just enter it into their devices, they also write the numbers on your place mats so the right food goes to the right person. You have what I’d call a “main” server, but everyone manages your order in a communal fashion. All of this makes for an efficient experience. Over the years, I’ve made Wagamama addicts out of several friends and co-workers. If you’re ever in Boston or in one of their many overseas locations, give it a try and let me know what you think! 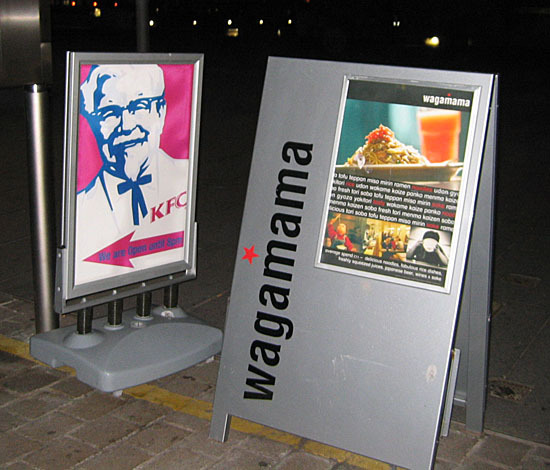 Maybe we can get a petition going to bring Wagamama west! 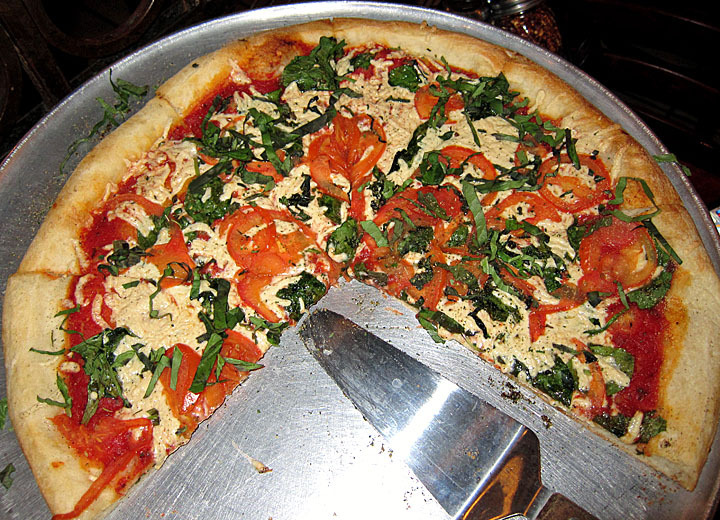 NYPD Pizza Delivers on Its Promise: The Perfect NY-Style Vegan Pizza in Phoenix! When I moved to Phoenix 15 years ago, my ability to successfully adjust to living in this town hinged on one important thing: the need to find decent NY-style pizza. I tried many “local favorites” and determined they were all inedible. Finally, two recommendations from friends rang true: Ray’s and NYPD Pizza. Both were at least 30 minutes from where I lived at the time, but I was raised in an Italian family that regularly traveled vast distances for “good pie.” But as both restaurants expanded their footprints, I was becoming a vegan. And so, my search for the perfect NY-style pizza was rendered pointless. Or so I thought! In July, a co-worker told me that NYPD Pizza had posted a question on its Facebook page, asking for name suggestions for their new vegan pizza, which would be made with Daiya cheese. I of course freaked out with anticipation. They said they would have it in stock in August. Despite my constant stalking and hounding of their Twitter feed and Facebook page, and calling the restaurant, no vegan pizza appeared on the menu. Finally, I gave up and stopped checking. I wrote it off as a promise unfulfilled. Until last Friday. I was trying to decide where to have dinner on Friday night, and checking to see if Green had posted any new specials on its Facebook page. The answer was “no,” but something made me think, “I should check NYPD’s page.” To my surprise, they had announced “the Veganizza” the week before, while I was out of town! I went to the NYPD website to get the specifics, and saw the “Gluten-Free/Vegan” menu option and became even more excited. Just be sure, I called my nearest restaurant to confirm they actually had Daiya in stock. All systems were go! It was worth the wait! 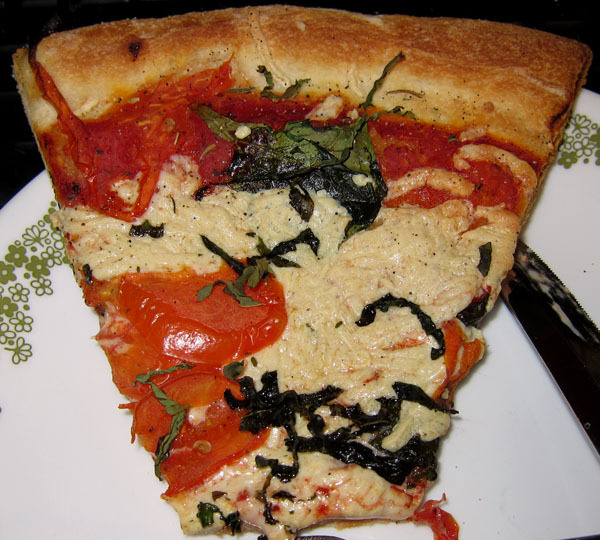 In my eagerness to get my hands of my first slice of Veganizza, I forgot to get a picture in its pristine state. 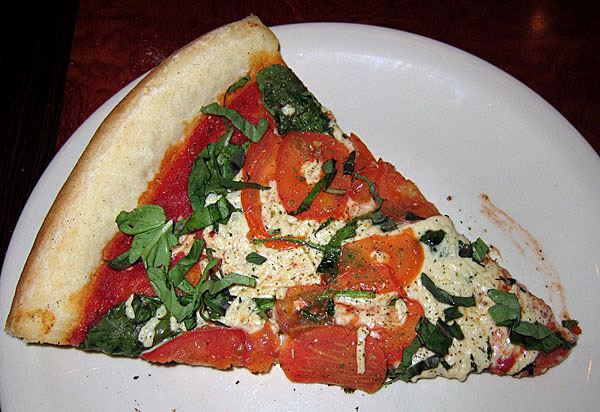 The Veganizza comes default with Daiya, Roma tomatoes, fresh spinach, basil and garlic. While it lacks the fake meat found on zpizza’s Berkeley Vegan, it makes up for it with excellent flavor and the perfect NY-style crust (defined as: very thin, but firm enough to fold). The proportions were perfect (just enough cheese and sauce) and the basil and spinach were a great combo. My only recommendations are that they should make sure the cheese goes all the way to the edge (which is always a complaint of mine with pizza – never leave a cheese gap)! And they need to cook it just a little bit more, but this seems to be an issue with restaurants that are new to cooking with Daiya – they just don’t trust the cheese! It’s okay though, because we had enough left over to cook it a little longer at home the next day. Next day pizza can’t be beat! The best part is, there’s an NYPD three blocks away from my office, so the phrases “Who wants pizza for lunch?” and “Hey honey, you worked late, how about I just pick up a pizza on my way home?” have re-entered my life! However, I think “I’m going to ride the exercise bike for awhile” may need to be uttered more frequently now as well! Phoenix Street Food Update: Vegan Pizza and Tacos! Now that the weather is getting a bit nicer in Phoenix, it’s time to start exploring the outdoors again – in particular outdoor vegan eats! 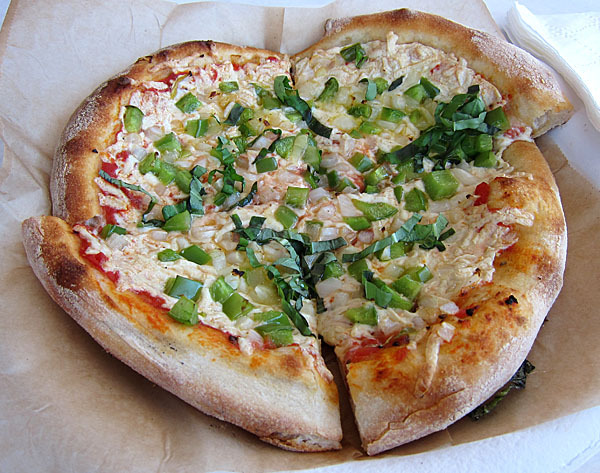 There are days when I just sit and contemplate what I love more – vegan pizza or tacos. This is a tale of both! I rarely get a Friday afternoon free to head down to Food Truck Friday, but I was highly motivated when I learned that the Pizza People food truck has a vegan Daiya cheese option. Quite possibly the best vegan pizza I’ve ever had was from a food truck in Portland called Pyro Pizza so I had to check these Pizza People out! 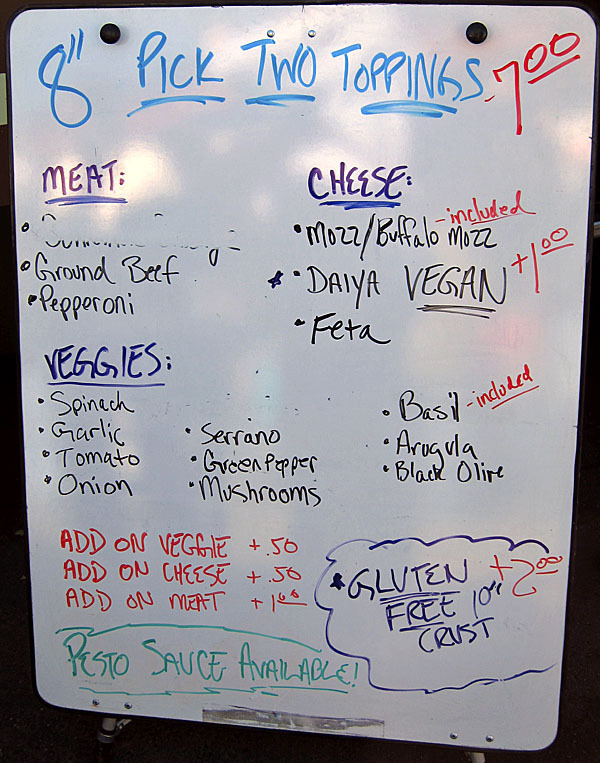 The menu was ideal – a good sized pizza for one, with a decent options of veggies. My husband went for spinach and mushrooms, and it was a very pretty pie. I chose a green peppers and onions pizza. The crust was nice and fluffy and the red sauce tasted fresh and light. I would, however, suggest they use a little less cheese (I know that’s sacrilege coming from Daiya-obsessed me). My guess is that chefs are nervous that Daiya won’t melt so they over-do it, and the excess soggifies the pie. 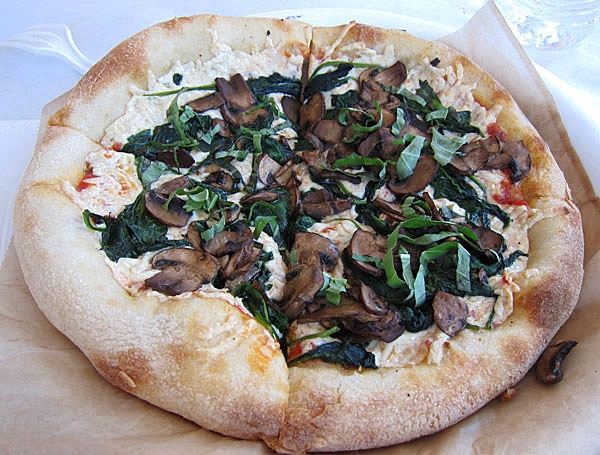 I saw some table-neighbors’ dairy pies that had the right ratio, so Pizza People, lighten it up a bit please and you’ll have an outstanding vegan pizza! While we were there, we checked out the menus on the other trucks. Clearly I’m going to have to track down the Uprooted truck at a future date. Check out the menu! 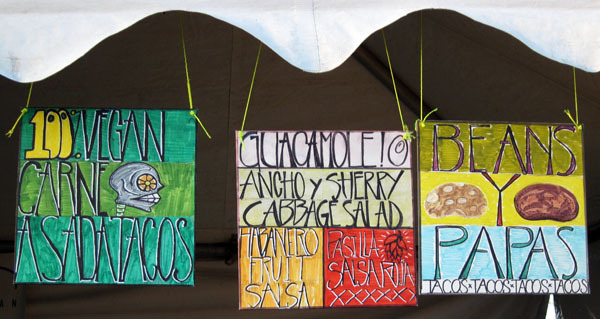 A week later, I found out Green Vegetarian was setting up a food tent at the Arizona Taco Festival, and lucky me — I won tickets by suggesting they make potato tacos! The festival was much more massive than I expected, but I’ll go to great lengths for Green’s tacos – so I was willing to battle the chaos. The sign for the Green tent was a little more subtle than some of the others, but they seemed to be getting plenty of traffic. 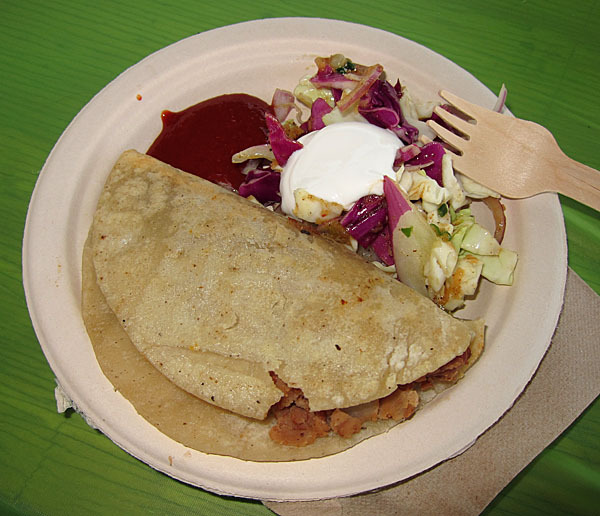 Green was serving two types of tacos: carne asada and potato with refried beans. Both came with a side of cabbage salad and a delicious hot sauce I don’t think I’ve ever had the pleasure of tasting at Green. I enjoyed the carne asada tacos, but not as much as a steak taco special I’ve had a Green before. The potato and bean tacos were fantastic. They only thing that could have made them better was, you guessed it, a nice helping of Daiya. 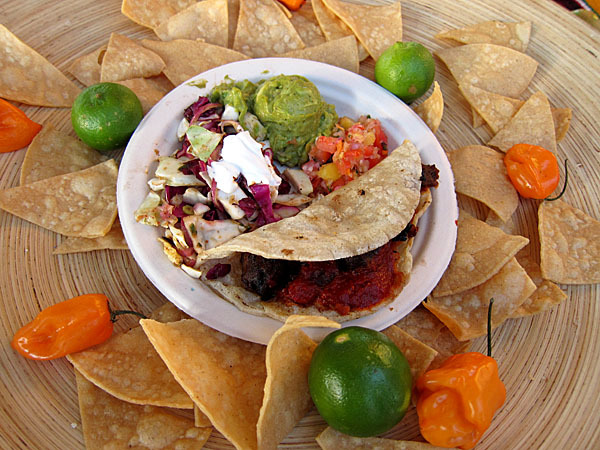 I now want tacos, especially these, added to the Green menu! I know they’d be a hit, because, well, I ate five of them! I’ve always been a fan of restaurants where you can be a part of the cooking process – from fondue to hot rock to Mongolian grills. 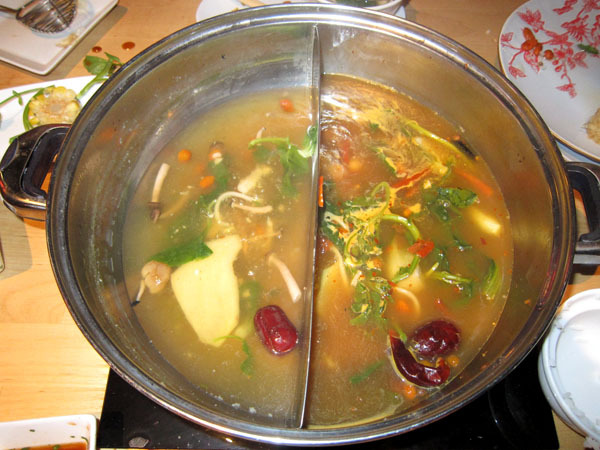 However, “hot pot” cooking – an Asian tradition that goes back thousands of years, has never been on my radar. 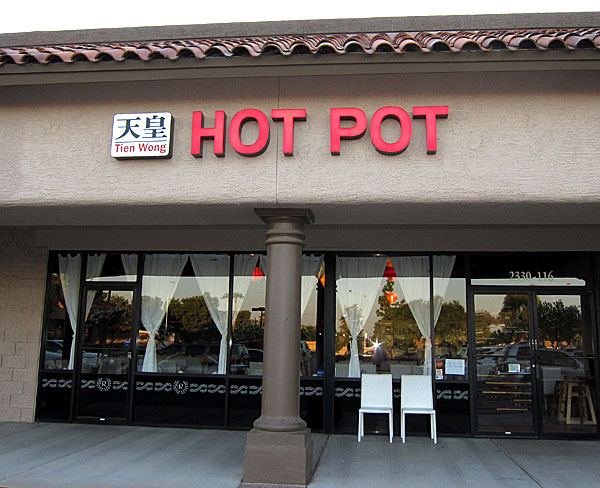 We had been curious about Johnny Chu’s (of Sochu House, Sens and Fate) Tien Wong Hot Pot in Chandler (on N. Alma School Road between W. Elliot and W. Warner roads), but rarely visit that part of sprawling metro Phoenix. An event in Mesa got us close enough to give it a try, and now that we’ve tried it, we can say it’s worth the trip! The restaurant is in an unassuming strip mall, and while tastefully decorated, it lacked the “urban hipness” I’m used to at Chu’s other locations. However, the service was very good, especially since we needed some coaching with ordering and cooking the food. 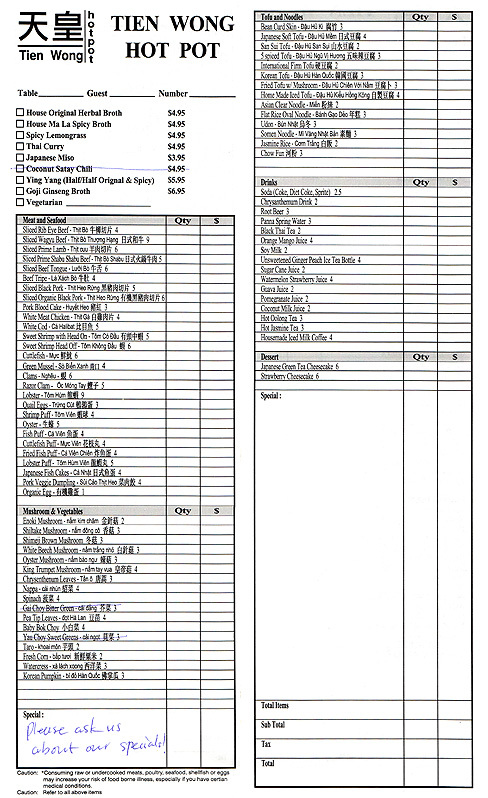 The menu is a check list of broths and ingredients. It can be a bit overwhelming to decide just how much to order. We probably could have made better choices, but it was a fun experiment. Since the prices are very reasonable (i.e. $2 for tofu), over-ordering isn’t really a problem. 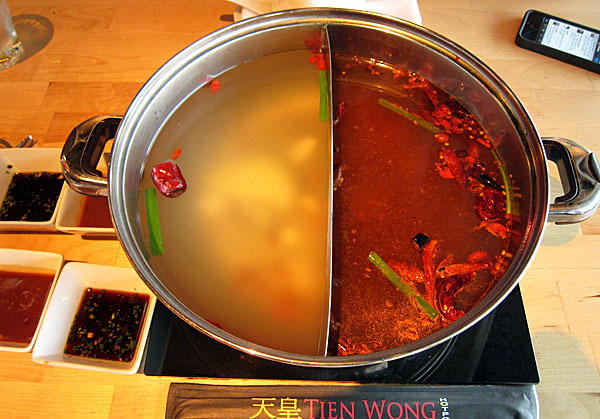 First, all of the broths on the menu can be made vegetarian (vegan). Just ask! We couldn’t decide on a single broth (I like spicy, my husband does not) so we went with the Ying Yang (half house original herbal broth, half house ma la spicy broth). I’ll admit I was a bit terrified when I saw how many hot peppers were floating in the hot side. I could feel my guts tremble in fear. Turns out that although it was incredibly spicy, I didn’t suffer the painful effects I expected (i.e. I wasn’t doubled over in pain at 3:00 a.m.). My guess is it’s because of the fresh, healthy and clearly vegan ingredients cooked in it, plus it didn’t contain the mystery oils and sugars normally found in spicy Asian food. I think next time we’ll try a compromise with the Spicy Lemongrass broth – more flavor that the original broth and less heat than the spicy broth. Then came the selection of items too cook. The basic vegan options are mushrooms & vegetables, and tofu & noodles. We ordered brown mushrooms (for my husband’s side only! 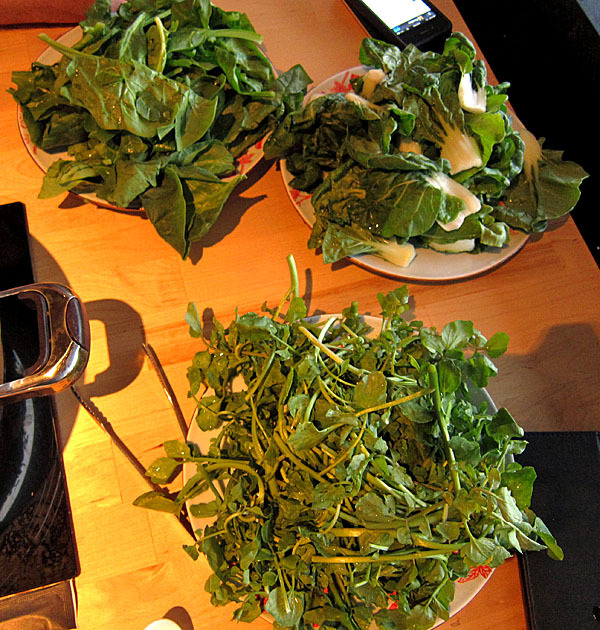 ), corn (which was on the cob – odd), baby bok choy, watercress and spinach. Turns out we ordered far too many greens. I think they should offer a few more standard vegetable options such as carrots, green peppers, onions, broccoli, etc. but I guess that wouldn’t be very authentic! They had a huge variety of different types of tofu. 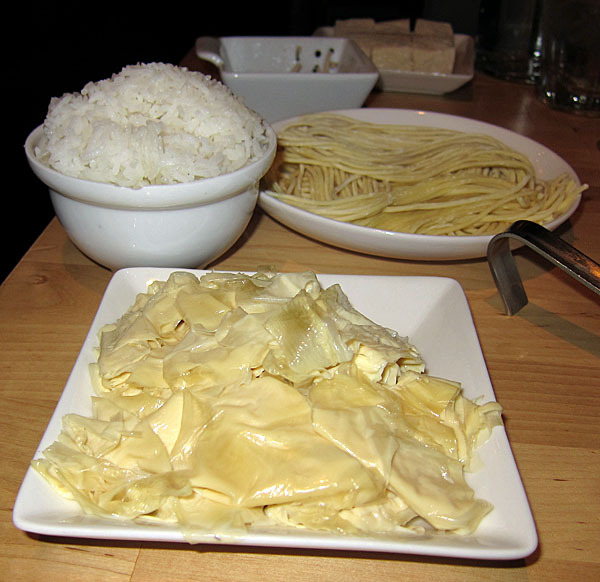 We opted for the bean curd skins and homemade iced tofu, both of which were fairly non-traditional. We probably should have ordered a firm or 5-spiced tofu just to have something with more bite. We also ordered udon noodles and rice (but the rice wasn’t needed). Also of note, the meal came with dipping sauces – one was a soy-based sauce, the other a spicy peanut sauce. Both were great – especially for items that didn’t gain much flavor from the broth such as the corn on the cob. Once we got through the ordering process, the magic happened. The broth was set to boil and we slowly added ingredients based on the directions given – longer for the corn, less time for the noodles and tofu. 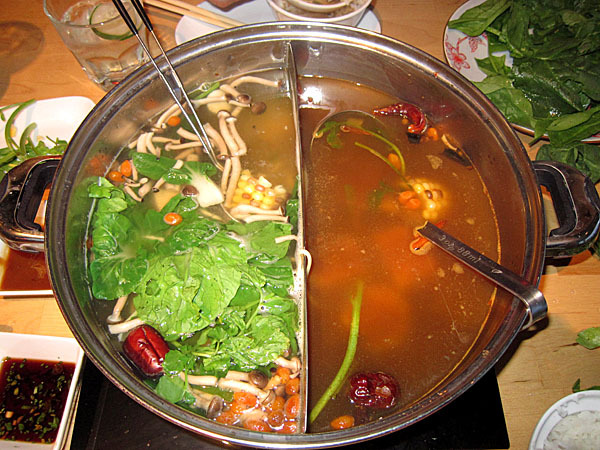 Soon the hot pot became a bubbling cauldron of flavor. Being able to cook the food ourselves was a fun, shared experience — great for a “date night.” The challenge was to not lose the tofu skins into the broth, or to burn the noodles that had sunk to the bottom of the pot. And of course it was important to not burn my mouth by eating the results straight from the pot (let it cool first!). At the end, the broth was transformed into a delicious veggie soup. While it might be a bit of a journey to get to Tien Wong from central Phoenix, anyone looking for an adventurous, healthy and totally vegan meal should make the trip. We’ll be going back soon!